Skyline Boulevard view overlooking Old La Honda Road west. 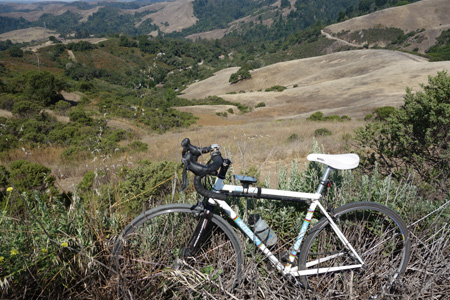 After several weeks away from the bike, making it to Skyline Boulevard becomes the goal. Today’s ride up Hwy 9 reminded me why living here is the cyclist’s paradise. As I rolled through Saratoga I saw lots of gleaming vehicles gathered for a car show, including my favorite — the Jaguar XKE. Mild temperatures brought out the crowd as I had plenty of company on the 7-mile climb. While it felt a bit warm on 9, a cool breeze greeted me at Saratoga Gap, 2550 feet. I continued north on Skyline Boulevard, where lots of motorists enjoyed a drive on the scenic route. Skyline views never fail to impress. Look left and there’s the fogged in Pacific. Look right and you see Silicon Valley. What a way to spend a Sunday morning. This entry was posted on July 21, 2013 at 1:43 pm and is filed under Ride reports. You can follow any responses to this entry through the RSS 2.0 feed. You can leave a response, or trackback from your own site. Ray, you know I love Skyline Blvd. too, esp the one lane section south of gist road, but lets not forget the high sierra ray, and roads like ebbetts pass for instance, when talking about truly gorgeous california roads with truly spectacular views, in my not so humble opinion….of course, which ever road had less cars would be the one for me. keep climbing!